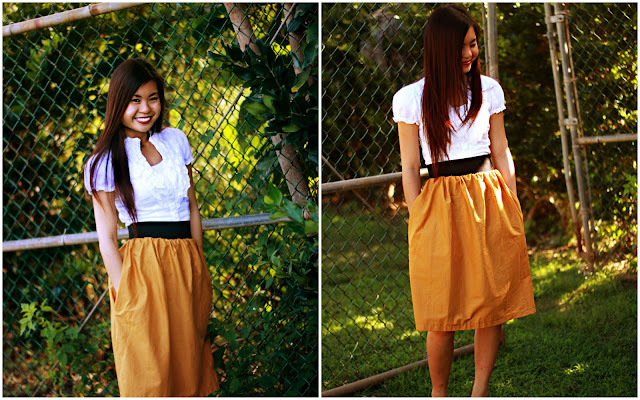 Mustard Me Yellow: DIY Gathered Skirt. I made this. FINALLY. I've been meaning to make this dang thing for months now! I'm not very good at sewing, so if I can make it you can too. oh my gosh! i am so impressed! it is darling! and I love your shoes?! who bought those for you? :) you should wear them to my wedding! Really that skirt (and you) look terrific. I made a skirt from that tutorial a couple months ago! Actually like 4...I made some for my nieces with all my extra fabric :) Yours looks so cute! YAY! you made it! WOw it turned out SO cute and so much better then my first skirt. Ha! So cute Christal.. What kind of fabric did you use? Yay pockets! Very cute skirt.